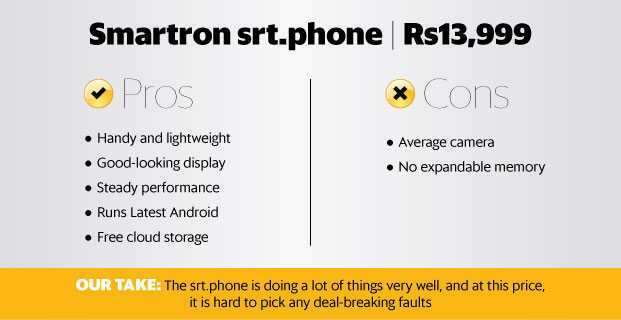 Smartron srt.phone is priced at Rs13,999 and is named after former cricketer Sachin Tendulkar. Indian tech startup Smartron is eyeing the budget segment with its second smartphone called srt.phone. It is priced at Rs13,999 and is named after former cricketer Sachin Tendulkar, who also endorses the brand. At this price, it is competing in an already packed Android smartphone segment dominated by the likes of Redmi Note 4 (Rs12,999) and Moto M (Rs13,999). The soft matte finish on the back and the flat edges along the side panel of Smartron srt.phone keeps the device smudge-free and makes it easier to grip. The srt.phone has a plastic body with a removable back panel, which comes off easily. It covers two micro SIM slots and a 3,000mAh battery. The soft matte finish on the back and the flat edges along the side panel keeps the device smudge-free and makes it easier to grip. At 155g, it is also lighter than the metal clad Moto M (163g) and Redmi Note 4 (175g). The fingerprint sensor on the back is well within reach and unlocks the homescreen instantly. The only niggle in the srt.phone is the position of the power button. It is placed on the top side panel and is not as easily accessible as the volume keys on the side panel. The 5.5-inch display has a resolution of 1,920x1,080p, which is what most good big screen smartphones, including the Redmi Note 4 and Moto M, offer. It is a good-looking display. Colours in movies and games look rich without feeling too bright, while text in webpages and ebooks look easier to read. The big screen provides ample room for gaming and typing. It has a layer of Gorilla Glass 3 too, to protect against scratches. Smartron srt.phone runs the near stock version of Android. The srt.phone is one of the few smartphones which run the latest 7.1.1 version of Android Nougat out of the box, in this price range. The other plus point is that it runs the near stock version of Android. There are hardly any unnecessary pre-loaded apps. Smartron’s own app called tronx provides unlimited access to free cloud storage and quick access to after sales team in case of any issues. The likes of Google Drive offer 15GB, while Dropbox offers 2GB of cloud storage for free. The Redmi Note 4 runs Android 6.0 with a complex looking MIUI. The Moto M has more in common as it runs Android 7.0 with stock Android UI. Smartron has used Qualcomm’s mid-range Snapdragon 652 octa-core processor. Though it is slightly less powerful than Snapdragon 625 octa-core chip used in the Redmi Note 4, the Snapdragon 652 was able to handle multi- tasking and games such as FIFA 16 and Asphalt Street Storm Racing without feeling sluggish or the phone heating up. Smartron has paired the processor with 4GB RAM and is offering 64GB storage space. There is no memory card slot, though. This makes the Redmi Note 4 better placed as it offers 64GB storage and supports microSD cards of up to 256GB. The Moto M runs on MediaTek’s equally powerful Helio P15 octa-core chip with 3GB RAM. It offers only 32GB storage but accepts microSD cards up to 128GB. The area where the Redmi Note 4 is significantly better than the srt.phone is the battery backup. Its 4,100mAh battery lasts a day and a half, while the latter’s 3,000mAh battery could eke out only a full day’s back-up on one charge. Camera is one of the weak links in the srt.phone. Camera is one of the weak links in the srt.phone. The 13-megapixel snapper struggled to muster enough detail even in outdoor conditions. Colours also look a bit washed out. Low-light shots look blurry and pale. Camera feels sluggish and has very few modes for users to play around with. The front camera can click acceptable selfies in well-lit conditions. The Redmi Note 4 also has a 13-megapixel camera, but handles colours better and is better at detail reproduction too. Smartron has impressed with the srt.phone in more ways than one. Its ability to handle heavy tasks with ease, the clean Android interface and a good-looking display makes it a solid addition to the affordable segment. However, the bigger battery and better camera of the Redmi Note 4 cannot be ignored.